Like a zombie that has been subjected to every imaginable attack and yet somehow keeps lumbering slowly forward with arms outstretched, the belief that price is the key variable that determines audience turnout in the theatre stays alive despite all evidence to the contrary. According to this mindset, when the audience does not come the problem is that ticket prices are too high. And so the solution is to lower prices – usually to a level far below what is necessary to cover the real costs of a show. But when your show is selling for $20, $15, $5 and the audience is still not coming, it’s not about price. It’s about something else. The problem is not that prices are too high. It is that they are too low. And all too often the overall quality on offer is too low. Price signals to the audience what the quality of the product is. Habitually lowering prices conditions the audience to believe that the product is not worth very much. And unfortunately, a lot of the time that is true. When it’s good (whatever “it” is – food, sporting event, concert, mobile device), the audience will pay any price for it. ANY price. That’s simply the way it works with humans. What all live performance should be striving for is creating an experience so utterly entrancing and unique, that the audience simply must have it at any cost. The latest evidence of this truth? 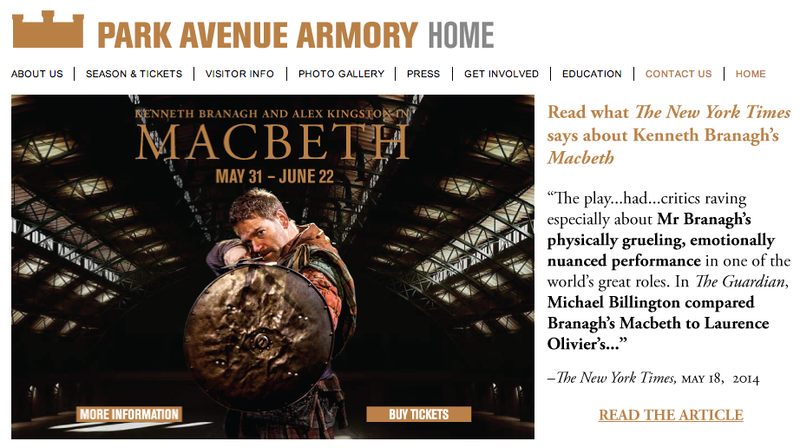 Tickets to see Kenneth Branagh in MACBETH at the Park Avenue Armory are $350. Now you might say, “This isn’t fair, that’s too expensive, everyone should have the right to see theatre, theatre should even be free.” That could be. But that social redistribution agenda is entirely separate from the artistic undertaking of creating a live performance event that is so good people must have it. Note that if the Park Avenue Armory supported the mission of providing low cost tickets, they could certainly do that. But the much more important goal to focus on is creating a product – an experience – that people want. And they have obviously done that. Ok, they didn’t do it – they simply brought in an existing show that had already done it. Great theatre should be every bit as exciting and compelling as a sporting championship or rock concert. And when it is, the price will (sometimes) be similar. Does great theatre have to be expensive? Of course not. But much more important to the audience than the price of a show is its quality. Remember the old saying: The audience is always smarter than the playwright. The audience is not dumb. When something is good, they’ll turn out. And when something isn’t good or interesting or compelling, they won’t turn out. No matter how cheap it is. There will be blood, mud, and serious (ticket) costs.